I just had this giraffe idea pop in my head. Since I've started paper crafting sometimes that happens--a cool idea jumps in my head. Honestly the image in my imagination is so much more spectacular than what I can get on papr, but it's fun to try. I made a new motherboard. A motherboard is a mixed paper that is created to make other projects. It's a super way to have a variety colors and patterns ready to go. I made mine by swiping on Distress stains, inks, and Tattered Angel Glimmermist sprays. Drying between layers keeps you from making mud. 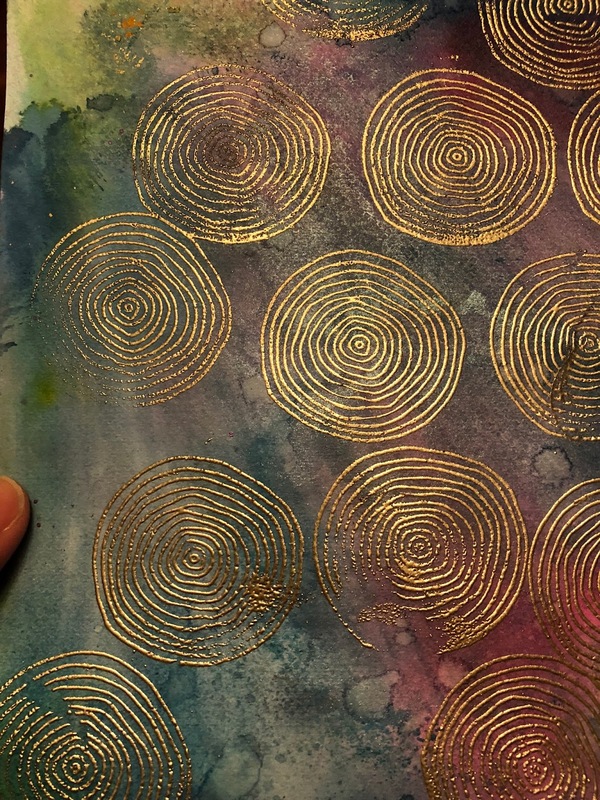 Then I stamped my Tiny Tree Ring stamp all over it with VersaMark ink and embossed it with Ranger Platinum embossing powder. I thought it looked great! To see more projects using a motherboard, click here and here. The background was Night paint dry brushed on with some splatters. 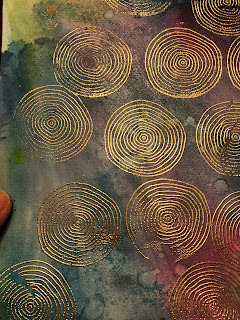 I used the Dina Wakely Daisy stencil to add texture with heavy gesso. 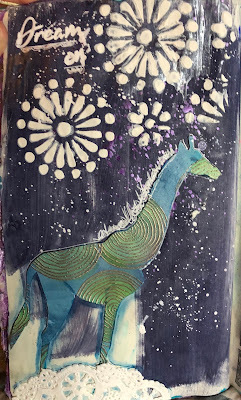 I stamped "Dream on" with a stamp from my Moondala stamp set. 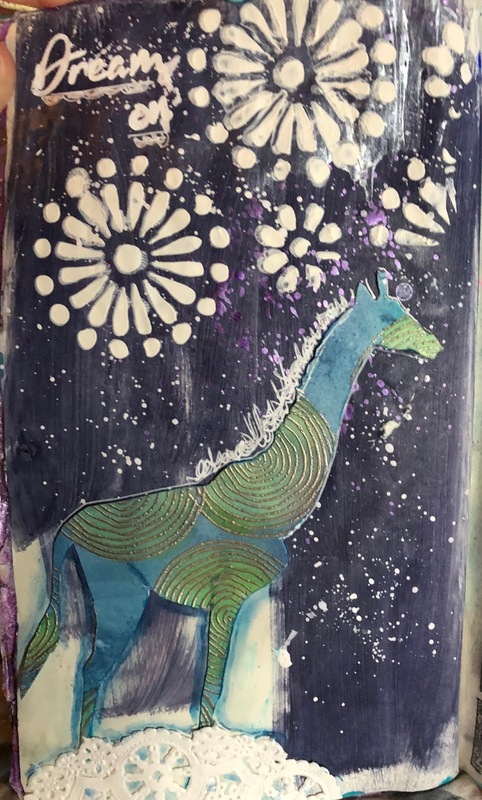 My scribble journaling on the giraffe's mane was made with just a white gel pen, and I also added simple highlights with it. I used a blue scribble stick for shadows. So our I think our lesson this week is let our crazy, wild imaginations fly free. Have you made a project straight from your crazy imagination? Do share! Want to peek at my Etsy shop? Click here!Materials: I'm proud to feature Pink Bunkadoo specialty products. I include Amazon affiliate links to quench your curiousity about a product I use. They are no cost to you and so far no earnings for me.